This unit is the146th New York Zouaves from the ACW. 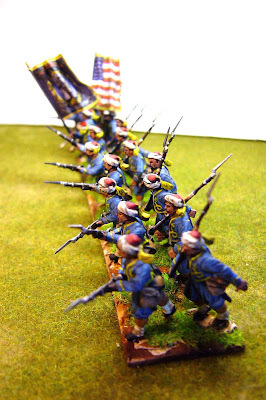 The uniform was obviously based on the French 'Turcos' uniform and these chaps surely must had stood out on the battlefield. 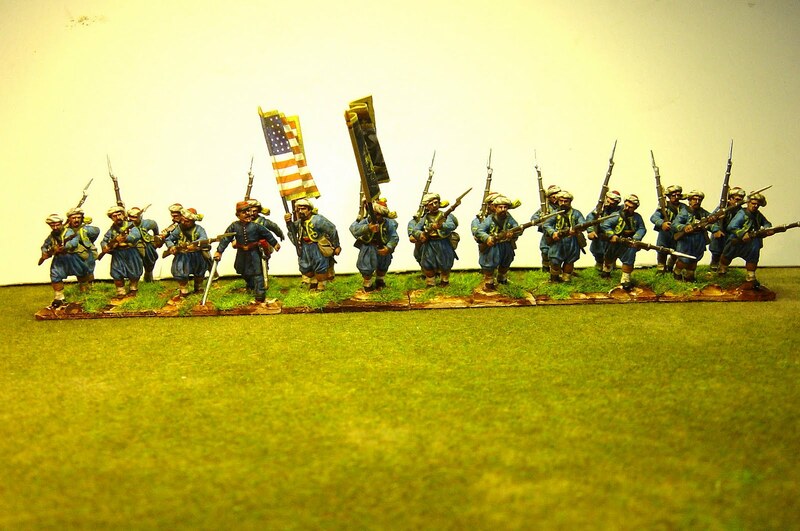 This completes the Zouaves from the Perry plastic box. I have just finished putting 31 lots of SYW French onto eBay. I'd love them to go to one home but I don't imagine that that will happen but please have a look. All have been painted by yours truly and took a very long time to complete. The first item number is 110658890827. Thanks for looking. As ray has said...very nice. those perry figs look very dynamic and you have used then well. Nice models. They were part of a brigade of Zouaves that was formed in 1863/4, so they were part of a colorful lot.